Now the articles from Q-day are out. 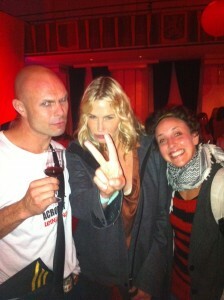 Me and Fofo were booked to entertain before and after a Q & A between Tilde Björfors and Daryl Hannah. I also had the chance to be part of the discussion and managed to get a few questions asked. Daryls passion for our planet is truly inspiring and I think the people left the tent outside the university of Lund with a lot of thoughts and with quite a bit of hope. Visit her website and read all about her work for keeeping this place a good place. Tilde also took the opportunity to invite Daryl to our shows in New York. I’m hoping she will be there. No credit to me for making this a good picture. This entry was posted in Circus and shows, Tour and tagged daryl hannah, dhlovelife, q-day, qday, region skåne, tilde björfors. Bookmark the permalink.